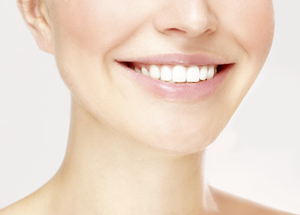 Veneers can restore chipped or damaged teeth. Veneer procedures are considered cosmetic dentistry and all four participating dentists at Dentists@Burswood can apply veneers in a simple, comfortable procedure that takes just a few visits. Typically dental veneers require minimal removal of tooth enamel compared to crowns. The process is considered to be permanent and usually irreversible. A thin veneer is placed over the front (visible) part of the tooth and bonded with a light-curing process. Mimicking natural existing teeth and appearing unnoticeable patients are advised to consider teeth whitening options to complement this cosmetic dental service. Teeth and gums also must be free of active periodontal disease and decay. Like any changes to the structure of your natural teeth you will be advised to change some small dental no-no’s such as biting your nails, chewing hard objects like ice, etc. Patients who grind or clench their teeth may compensate the risk of breaking a veneer by wearing a fitted splint (similar to a mouth guard) whilst sleeping. Good oral hygiene each day with brushing and flossing will help maintain your oral health along with regular visits to the dentist every six months. Porcelain and ceramic veneers are extremely thin shells made of strong and durable dental materials designed to last upward of 20 years. Usually around 0.5mm thin they can also be a little thicker to align against other teeth or in-fill gaps. The cosmetic dentist will prepare the tooth by removing minimal structure to allow the new veneer from feeling bulky or protruding from your natural smile. Impressions taken of your teeth are sent to the laboratory with the shade selected by the dentist. Two weeks later the dentist checks the shape and fit of your new veneer and inserts by bonding to your prepared tooth. Resin-based composite veneers are generally cheaper than porcelain and ceramic veneers as their life expectancy is only around five years or so. As there is no laboratory involved the cosmetic dentist builds and places these types of veneers all in one appointment. Your tooth or teeth are prepared by the dentist carefully bonding and sculpting composite material in layers to match your existing teeth colour. This material is a similar resin-based composite used for other tooth-coloured fillings. A special dental curing light is used to harden the composite, and the veneer is smoothed and polished to look like a natural tooth. If you have any questions about our cosmetic dentistry services, please contact us today.